I’ve changed the timeline again. Iris is still gonna die. Or maybe Malfoy is going to die because he is going to sacrifice for Snow. Anyway... Have your reactions and monkey business and stuff now that we have Tres Flashes. 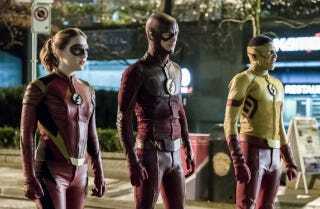 Episode Synopsis: Grodd and his army of gorillas bring the battle to Earth-1, but the Flash and his team try to stop them before they destroy Central City. Meanwhile, Gypsy returns to join the fight; and Jesse Quick decides she wants to stay with Wally on Earth-1.